Vocalisms, the new album with Mary Mackenzie, soprano and Heidi Louise Williams, piano, has been submitted for a Grammy in a couple of different categories – if any one reading this is a Grammy voter, please consider this marvelous anthology of contemporary song with music by Rorem, Harbison, Daniel Crozier and myself. Read more here. When I asked my friend Susan Stewart to write a set of poems for a new work for soprano, she responded with reflections on the mysterious prophetess spoken of in Virgil and Ovid. The sibyl sings of her prophecies written on leaves, and of how the god possesses her; she warns Aeneas before his descent to the underworld; she celebrates the moon. Having been granted eternal life, but failing to ask for eternal youth, she is reduced to no more than her voice. I understand the sibyl as an archetype of the musician who sings for us of fate and the mysteries of life, death, and love; who guides us in moonlit and shadowy places; and whose prophetic voice resounds unendingly, in power, and in vulnerability. A Sibyl was written for Collage New Music on a commission from the Fromm Music Foundation. I am grateful to the Foundation, to Collage, and to Mary Mackenzie for making this work possible, and to Susan Stewart for words to sing. Mary has performed many pieces of mine, and she recorded Sacred Songs and Meditations with the 21st Century Consort, led by Christopher Kendall. She has also recorded a big 2-CD collection of songs by various composers with pianist Heidi Williams that will include four pieces of mine, to be released on Albany later this season. Collage Fellow Joseph Sowa published an interview with me on the Collage website – I talk there about working with Susan’s poetry and my history with Collage. Christian Carey has reviewed the 21st Century Consort’s Cathedral Music CD here. I’m delighted to report that Albany Records has released Cathedral Music, a new CD that includes my Sacred Songs and Meditations along with works by Stephen Albert (Cathedral Music) and Christopher Patton (Out of Darkness). I devised the piece at the request of Christopher Kendall, who wanted something for a concert celebrating the new millennium to be performed at the National Cathedral in Washington, D.C. To honor the notion of “a thousand years of music”, the work is based on ancient sacred tunes – plainchant and more – and is written for a solo soprano, chorus and Christopher’s two consorts: The Folger Consort and The 21st Century Consort. For this recording, Mary Mackenzie is the superb soloist. The piece alternates instrumental fantasias on the old melodies with settings of the tunes for soprano, all scored for a combination of early and modern instruments. Before each movement the men and children of the National Cathedral choirs sing the tune on which the movement is based. In addition to the virtuosic and atmospheric performances by all the musicians, the disc benefits from the lovely resonant acoustic fashioned by engineer Mark Huffman and producer Joseph Gascho. When I made the piece, I assumed it was sort of a one-off, given the unusual forces required, and would never be performed again. Christopher, bless him, proved me wrong, programming the piece a few years ago prior to the recording session. Go here for a post about the performance and recording, including pictures and personnel credits. Thank you to all concerned, especially Christopher and Mary. 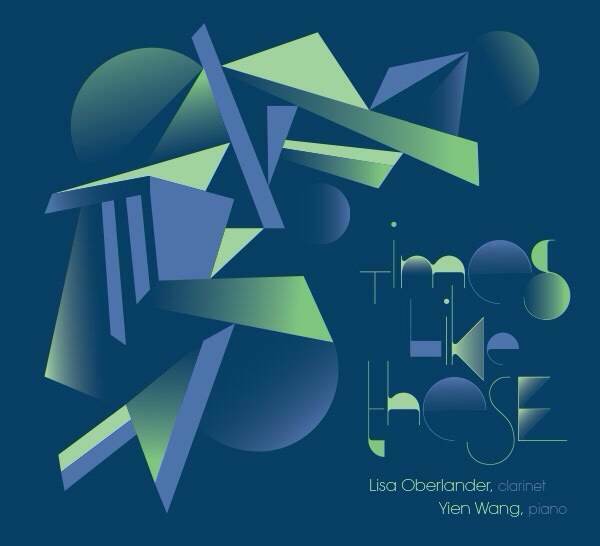 An mp3 download of clarinetist Lisa Oberlander‘s album Times Like These is now available at Amazon. Yien Wang is the pianist on the album, which is a nice mix of new music and older repertoire. I wrote the title piece for Jean Kopperud and Stephen Gosling who recorded it for Albany. Lisa has now played it – brilliantly – several times, and recorded it for Potenza Records. I expect the physical CD will be available soon. Check out video of Lisa and Yien performing the piece by clicking on the “video” link above. Lisa Oberlander, clarinet, and Tatiana Muzanova, piano, will be performing my Times Like These this coming Sunday, August 3, as part of the International Clarinet Association‘s ClarinetFest 2014 in Baton Rouge, Louisiana. This convention is a big deal in the clarinet world, with tons of concerts, lectures, exhibits, and so forth. Lisa’s performance will be part of a 12 noon recital in Shaver Theater on the campus of Louisiana State University. Originally commissioned and premiered by Jean Kopperud and Stephen Gosling, and recorded by them for Albany, Times Like These was recently published by the Theodore Presser Co. However, I don’t see it listed yet on their website, nor at Sheet Music Plus – if you are interested in the piece, I suggest contacting Judith Ilika, head of promotion at Presser: jilika@presser.com. I know they have the PDF file of the score that I sent to them, so be persistent and I’m sure they will eventually get you the music. UPDATE: you can purchase the piece at the Presser website here. Judith Ilika no longer works for Presser; you can try sales@presser.com for questions. I’ve written before about the free music service Freegal, which I access through the Free Library of Philadelphia – you need a library account (from the FLP or you can try your local library) to use the service. You can download three tracks per week, free of charge, and, as the name suggests, it’s totally legal. The catalog of music is enormous, and I now notice it includes music from New World Records and Albany, two prime sources for new music. My own album on New World, Icons, is there. I don’t know if these labels were represented all along and I just never noticed or if they are new additions, but the point is that you can access them now. Freegal lacks a decent search engine, and lists classical recordings by performer, not composer, but it is still worth looking around the vast list of material. By the way, did you know that New World’s project to make the entire CRI catalog available is complete? I want to remind you of the performance of my Times Like These in Georgia this week. Clarinetist Lisa Oberlander is joined by pianist Yien Wang in performing the piece that was commissioned by Jean Kopperud for her “Extreme Measures” project, and subsequently recorded by her and Steve Gosling for Albany. Lisa’s program is on September 6 at Legacy Hall, RiverCenter for the Performing Arts, Schwob School of Music, Columbus State University, Columbus GA.